SCVNGR is a game-based geolocation application where users can earn points or gain rewards by completing challenges and treks. Builders design questions that involve text based answers (open ended or multiple choice), QR codes, or photo challenges. 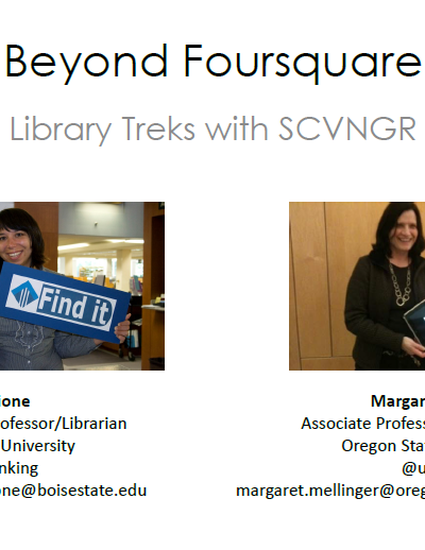 Librarians at Boise State University and Oregon State University have built treks and challenges using SCVNGR for library orientations and instruction. They have found SCVNGR a better environment than Foursquare for these purposes. With SCVNGR, students can participate in the challenges and treks using not only their smart phones and mobile devices, but also via text-messaging and laptops. Librarians can easily create multiple places within a single building or location, facilitating tours within a library space. In addition, SCVNGR is amenable to working with universities and libraries. Participants will gain an introduction to SCVNGR, discover how to use SCVNGR in their own library environment, and learn how these universities have utilized SCVNGR successfully.